I’ve been a Teksavvy customer for a looooong time. I came late to the internets ~ 2001 or so and I started out with those free discs from the post office. I moved up to NetZero and got my netz five minutes at a time – as long as I continuously clicked on ads. I was so very poor and it was this or nothing. Eventually I got so frustrated that I revamped the budget so it included a real dial up connection. I wanted a local company, found Teksavvy and hitched my wagon. I’ve been a Teksavvy customer ever since. It pleases me greatly that Teksavvy is a leader in support of net neutrality and against User Based Biling (UBB). Because I’ve been with Teksavvy so long I’ll qualify to keep my current package (200 GB for under $40) under the CRTC’s grandfather clause if some kind of UBB is approved. I sure hope it isn’t and I’ve written my representatives and donated to OpenMedia.ca. However, I’m well aware of wishes and horses, etc. What I’d really like to do is completely drop the account I currently have with Bell – the one that brings the internet across the phone lines to the house. I want to switch over to dry DSL. Unfortunately, if I switch to dry DSL, Teksavvy’s phone staff believes they’ll consider me a new customer on a new account and I’ll lose my grandfather-eligible status. In the spirit of THATcamp and trying new things, I’m trying something new here. If all goes well, my notes from the “Everything Google” Bootcamp this past weekend at THATcamp Bay Area should be embedded below. The session was run by Mano Marks, a developer advocate (DA) at Google. My reflection on the session is below that. I’m not sure what type of research I’d use Fusion tables to model, but as I work through the examples I might figure that out. I spent a lot of my time trying to copy Mano’s urls into my own browser so I could follow along with what he was doing. It got easier once I found a data set to manipulate, but I would have gotten more out of the session if I’d been able to work through some meaningful visualizations instead of watching a demo. There were some great examples shown and I tried to gather the urls for those for working through later. I thought we were going to get an intro to working with the api, but I think we attendees were more beginner than Mano had expected. I’m not a developer yet, but I’m working on it. He did mention that as a DA it’s his job to answer questions people have as they work with the api and if a group gathers 25-50 people (local to SF) or 50-100 (outside the area) Google can send an advocate to run a bootcamp session. Something to keep in mind as I get further along here…. I started my THATcamp Bay Area weekend in a bootcamp session on Text Mining with Aditi Muralidharan, a graduate student at UC Berkely. (@silverasm & http://mininghumanities.com). Links to the slides from the session are here. The session was geared for people who collect the data then ask “what do I do with all this stuff?! ?” This definitely describes me. I have hours and hours of collected oral histories plus a few diaries and log books I’d love to analyze. In its most basic definition, text is words. N-grams: are sequences of 1 or 2 or 3, etc words. In the sentence “I had a great time and learned so much at THATcamp” the 1-grams are I, had, a, great, time, and, learned, so, much, at, and THATcamp. The 2-grams are “I had”, “had a”, “a great”, “great time”, “time and”, “and learned”, “learned so”, “so much”, “much at”, “at THATcamp.” The 3-grams are “I had a”, “had a great”, “a great time”, etc. Text mining can examine how many times an n-gram appears. Sentences can be built by stringing together n-grams. Sometimes they sound a bit off. Stanford Tregex was given as an example for visualizing results from parser as trees. This makes results much easier to analyze. Metaphors, irony, sarcasm, emoticons, etc. are hard for parsers to spot. Basically this is all of literature. 😉 Computational linguists haven’t dealt with this yet, but perhaps this is where digital humanists come into the conversation. Computational musicologists have been analyzing sound bites since the late 1960s but there doesn’t seem to be much cross-pollinating there yet. Topic modeling is a way to group words that are frequently used together; these are often sematically coherent. “Dynamic topic models” shows topics plus how they have changed over time. A popular toolkit for topic modeling is Mallet. So far there has been an emphasis on English language tools so other language tools are not very good yet. Arabic and French language tools are getting there, but I didn’t catch which ones were worth checking out. The first step of text-mining is to digitize records. OCR, mechanical turk, and grad students were suggested as possibilities for getting through this stage. I’ll be working through this list (just as soon as I get my text in a digital format that can be processed). So THATcamp Bay Area is winding down. The unconference is over and a handful of people are hanging around having post-conference conversations, enjoying the sun, finishing the beer. Pizza has been ordered and a couple of us are working on wrap up posts before we return to our daily grind. I want to try to maintain the momentum that THATcamp has begun so am writing my notes and posting them before I get distracted by work and family responsibilities. It’s been an incredible weekend: 75 people shared their ideas, projects, successes, and failures. I’ve met so many incredibly talented, intelligent, and generous people and I want to continue the conversations we started this weekend. I’ll post the notes I took in the sessions I attended and I hope others will do the same. I want to read your notes; I want to know what everyone learned. I have notes for Text mining, Organizing an Unconference, Augmented Reality 4 Poets, Google Fusion Tables, and some possibilities for After THATcamp. I’ll link them up as I post them. I’d like to send out a special thank you to Jon Voss and the rest of the THATcamp Bay Area organizing committee for an incredible weekend. It was wonderful to meet people that I’ve been following on twitter and to find so many new people to follow. I’m excited for the follow ups we started cooking up in the last session of the day and hope we stay connected. The symposium will take place in McPherson Lounge at Alumni Hall on the University of Windsor campus. I’ve been a regular reader of ProfHacker since its launch. The posts (tips and tutorials for higher ed), are helpful – and usually timely. Just as I’m thinking about or needing something, a post turns up providing useful tips, often with links to more info. However, the mass of bookmarks I’ve accumulated is losing its effectiveness because there are just too many. What I really needed was an easy way to search the site. I’ve taken my ProfHacker addiction as an opportunity to create a Firefox search plugin. Now when I need to find something on ProfHacker, I tool over to my browser search bar (using Ctrl+k / Cmd+k), choose ProfHacker from the list of available search engines, enter my query, and I’m off. And because I like to share, you can click here to get the plugin that will search ProfHacker. In Death So Noble, Jonathan Vance explores how Canadians constructed a collective memory of the First World War based on “fact, wishful thinking, half-truth, and outright invention.” Vance endeavours to explain how Canadians gave birth to the myth and how it became embedded in the collective consciousness in the 1920s and 1930s. Vance argues that while Canadians waited for the official record of the War they assembled their own story. Canadians were intent on distinguishing the war as just, holding in high regard the ideals of “Liberty, Truth, Justice, Honour, Mercy, [and] Freedom.” To contemporaries, the myth “answered a need, explained the past, or offered the promise of a better future.” Canadians needed a way to justify the atrocities, deal with their grief, and attach meaning to the personal and national losses caused by the war. Vance’s sources include art, music, fiction, memoirs, memorials, film, speeches, elementary school curriculum, and Veteran reunion programs and menus. He champions these atypical and unusual sources, arguing that flawed writing does not diminish an opinion. In searching to understand the public war myth, Vance chooses not to judge amateur writers against professionals but to evaluate each memoir or poem for its contribution to the myth. Including these primary sources is essential to show that the Canadian public was actively involved in constructing the myth. That the sources are so varied supports Vance’s argument and makes for an engaging read. 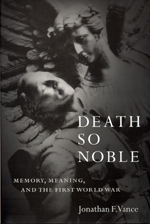 Death So Noble is extremely readable. Vance’s sophisticated arguments and detailed citations satisfy an audience of critical historians, but the clarity with which he writes maintains a text that is accessible to a broad audience. Vance includes an impressive array of secondary sources, distilling their arguments and infusing them coherently into his own. SHARCNET Research Day is the premier annual event at which SHARCNET professors, postdocs and graduate students meet to learn about each other’s High Performance Computing (HPC) related research. via SHARCNET Research Day 2010. Thanks to debugging help from @Rob_Russell, I managed to get Omeka installed and running on two separate development sites this week. For the most part, the Omeka documentation was great for getting me through the basics of downloading and setting up but I ran in to two problems: one was php-related due to the host I use (1and1) and the second was all thanks to mod_rewrite. After adding this line I was able to complete the install but then found a mod_rewrite problem. I could see the home page just fine but all links off the front page produced errors. Fixing this problem required adding RewriteBase rules to the root .htaccess and also to the .htaccess in /admin and /install. After adding these rules I was able to complete the setup and navigate to all pages without a problem. I’m looking forward to playing with the theme and adding content. Many thanks to the Centre for History and New Media!